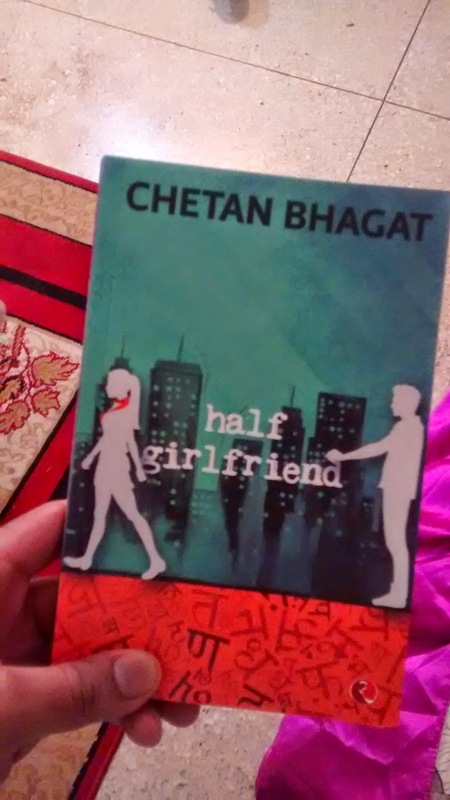 Half girlfriend by Chetan Bhagat is the story of Madhav Jha. He is the fateful prince from Dumraon, Bihar and is passionate about Basketball. He makes his way into the most prestigious English graduation course of the country, when he gets selected into St. Stephens College in Delhi University by using his eligibility from the sports quota. There he meets Riya, an uptown high class girl from Delhi, who comes from a family of means. They have drastic difference if you see the section of the society they come from, the basic thought process that they carry, the value system that they possess and the way in which they take decisions. However they click with each other for a lot of reasons, and ultimately the boy-girl saga that these protagonists engages into, forms almost eighty five percent of what this two sixty page book has to offer. With the MRP of 176 (highest priced book by Chetan Bhagat), a break of almost four years from fiction novel writing (longest ever taken by the bestselling author), and much buzz about the exclusive distribution of this book using the e-commerce partnership of Flipkart, the book was sold in huge numbers right from the day of its release. Apart from the story of Madhav and Riya, this book boldly makes an effort to touch upon larger themes like contrast of urban and rural mindset, class conflict, shallowness of the rich lifestyle, and most importantly the lingual slavery that our Hindi and regional language speaking masses have to be under English language. There are commentaries on a range of other social topics too, like always and author has made sincere efforts to be inclusive in touching upon various themes of contextual relevance to the youth of this country. Yes, there is sincerity in the choice of themes that are forming the background of the love story, but because of poor choices in execution, the book touches everything too dramatically and very much on the surface. While quality of the Literature is something that is always criticized upon for Chetan’s books I nevertheless always refrain from talking about it because I understand the fact that Author has consciously always tried too hard to be the writer for the most ordinary Hinglish generation. This is a fact already much known to everyone, and perhaps also to Chetan who self mocks his works in a portion of the story where Riya when teaching Madhav, most basic English, asks her to read books of “that author who writes simplistic English”. I believe that the treatment of the story telling, even if it is trying to be common, should not be clichéd, repetitive, mundane because of the reason that it is trying to be “non literary”. There are already movie rights, casting rumors for the same getting viral on the internet for this book, and it is not surprising but equally disappointing that Chetan has again over burdened his characters by cheesy dialogues, pushed over scenes, third grade movie screenplay around them. Riya somani, who is mysterious, unapologetic for long, self enclosed in her complications could have been a much more vivid character if she was not trapped into the most repetitive descriptions that ever leading lady of Chetan’s books have to go through – the baby pink suits, the perfect eye brows, shiny lips, idiotic girl-boy replies in middle of complicated life traumas. Madhav Jha is sincere, has a setting around him that he displays in splashes within the story, especially in the under confident moments, where he battles out fear of failures to emerge on top of situations, especially when he conquers the English Speech in front of Bill Gates. However he too is a Chetan Bhagat front man – and is forced upon to crack jokes at silliest of places, appear cute when he should have been better left alone to behave more realistically, use catchy heroic phrases when talking to himself, beat his own trumpet, describe girls in the most stereotypical ways – repeating a lot of what has already been said and heard by the readers, from the mouth of male protagonists of Chetan’s books. The book is filmy to an extent that you can literally visualize a Swades, a wake up Sid, a Hum Tum and what not from popular Bollywood similar settings in between as its sub plots unfold. There are online social networks, filled with popular praises yet for the book, because I think different target group and their own personal exposure would perhaps generate a much different response from them. There is a copy of this book around me, in every one’s hand and a lot of people who have started reading it are finding it entertaining so I guess the mass appeal that this phenomenally bankable author promises to deliver has been achieved again, but I feel he needs to regain the sincerity he once possessed in his story telling, and characterization of the simple people his books talk of. The book is predictable, repetitive and I am sure the next book that he would write, would bring better out of him. He is a writer who speaks for the generation he represents, and I certainly hope he does a better job out of it and remembers the roots of his own ideologies and not focus on numbers, and collections. I rate it a generous 2 on 5.